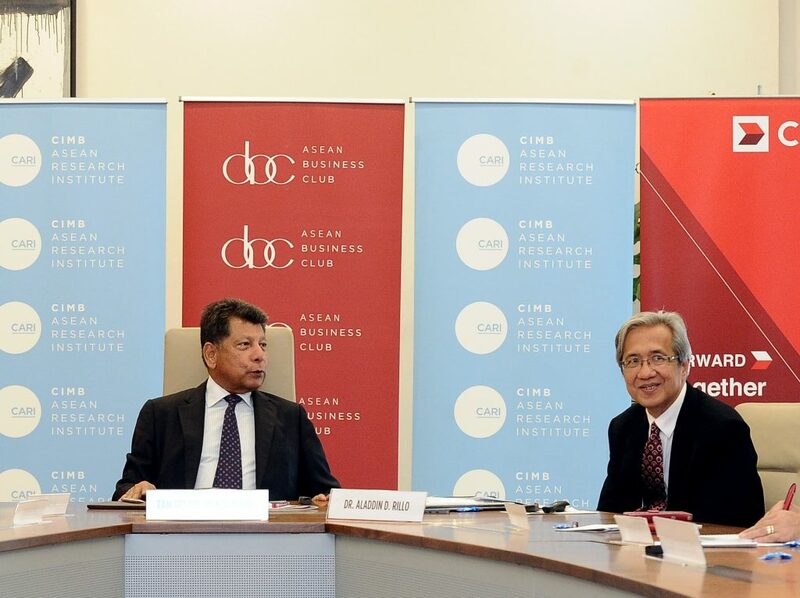 (From left) Tan Sri Dr. Munir Majid, Chairman of CIMB ASEAN Research Institute (CARI) and President of the ASEAN Business Club and Dr. Aladdin D. Rillo, Deputy Secretary-General of ASEAN Economic Community sharing their thoughts during the CARI Briefing session on “Progress, priorities and challenges of ASEAN Economic Community (AEC)”. The briefing was organised by CARI on 25 September 2018, in collaboration with the ASEAN Business Club. Kuala Lumpur, 25 September 2018 – ASEAN economic integration is making progress but further deepening of market integration and greater momentum are imperative to meet the AEC 2025 targets. Dr. Aladdin D. Rillo, Deputy Secretary-General of the ASEAN Economic Community (AEC) said that the AEC, whose end goals include eliminating tariff barriers, reducing costs and enhancing competitiveness among ASEAN member states, has achieved substantial targets to date. “Tariff elimination is on track through the ASEAN Free Trade Agreement (AFTA), trade facilitation has become more flexible, and the investment regime is much more open. Most of the priority measures under AEC this year are to be implemented by end-2018,” he said. Dr. Aladdin D. Rillo, Deputy Secretary-General of the ASEAN Economic Community (AEC) shared these updates at the second edition of CARI Briefings titled, “Progress, priorities and challenges of the ASEAN Economic Community (AEC)”, which was organised by the CIMB ASEAN Research Institute (CARI) and the ASEAN Business Club today. In terms of the movement of goods, Dr. Rillo said the first protocol to amend the ASEAN Trade in Goods Agreement (ATIGA) was signed at the 50th ASEAN Economic Ministers Meeting recently, allowing for the operationalisation of the ASEAN-wide self-certification scheme. To address non-tariff measures in ASEAN, guidelines for the Implementation of ASEAN Commitments on Non-Tariff Measures on Goods was endorsed. The ASEAN Single Window (ASW) is now operating in Indonesia, Malaysia, Singapore, Thailand and Vietnam while other countries are expected to come on board by end-2018 or early 2019. As for the movement of services, the protocol to implement the 10th AFAS Package which provides liberalisation of more services sectors with higher degree and depth was also signed at the 50th ASEAN Economic Ministers Meeting. Additionally, the existing ASEAN Solutions for Investments, Services and Trade (ASSIST) will further include trade in services with the soft-launch which is expected to be held at the ASEAN Business and Investment Summit (ABIS) in November 2018. In response to the challenges of the digital economy, ASEAN has endorsed the ASEAN Agreement on e-Commerce and the ASEAN Digital Integration Framework with focus on infrastructure, regulatory frameworks, skills upgrading, and engagement with stakeholders. The AEC Council is expected to endorse the ASEAN Digital Integration Framework (DIF) at the ASEAN Summit in Singapore this November. “ASEAN hopes for the markets to help establish infrastructure that supports market connectivity, innovation and technology to enhance AEC. Markets should also explore financing mechanisms that supports market integration including new financing products and services, as well as innovative financing solutions. It is also hoped that the market reduces the incentives for excessive risk-taking and eliminates economic moral hazards that may undermine market contestability should be reduced in the region,” said Dr. Rillo. Addressing the rising trade tensions, ASEAN economic ministers recognise the seriousness of the rising protectionism that has led to uncertainties in global economy. ASEAN’s position is to push for further deepening of market integration through the implementation of the AEC, and the strengthening of external relations with ASEAN’s dialogue partners. CARI Chairman Tan Sri Dr. Munir Majid, who chaired the briefing, welcomed the progress made by ASEAN governments, especially the further liberalisation of trade in services. He cautioned that ASEAN must continue to champion trade liberalisation despite the rise of protection.